"How can we get just one person to engage with our brands, to have a different experience and make magazine media sticky again?" 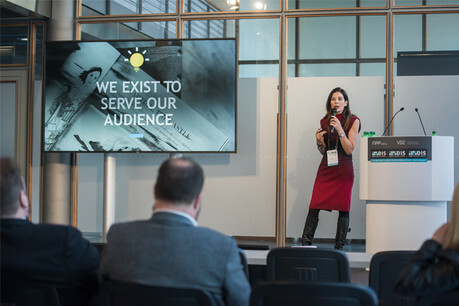 Julia Raphaely, CEO, Associated Media Publishing asked at Digital Innovators' Summit (25 March). It is a question that a lot of publishers from different sectors of the industry are asking themselves as they seek to innovate, discover new audiences and improve cash flow. With advertising playing a crucial role in their magazine titles, Raphaely identified e-commerce sales as something the business needed to improve upon. "One of our high moments was when I was working with one of the biggest retailers in South Africa, and he said to me: ‘I’m a retailer and you’re a publisher, so I’m not sure how much our businesses have in common'," she recalled. "That made me start thinking that every single page in our magazine or our magazine platform is actually a shop window. "That changed my mindset on our business from reader to consumer. That was quite fundamental, as publishers really focus on the reader. At the end of the day what gives us value and relevance not only to our audience but our partners in advertising, is to talk to our consumer." A partnership with mobile payment solution Snapscan followed, which introduced QR codes into titles such as Cosmopolitan, House and Leisure, Marie Claire and Good Housekeeping to drive advertising sales. But it is not enough to simply put technology out there, Raphaely warned; publishers need to influence the adoption by showing their readers that it is an easier and better experience. "One thing we learned was 'never overpromise and under-deliver' because you’ll shoot yourself in the foot if you do. For example, we couldn’t promise sales, but we could promise an influencer, we could be part of the journey. But you’re not going to bring e-commerce in South Africa from two per cent to 20 or 30 per cent overnight. "It's not a one-stop shop, it’s a long journey. You’ve got to be focused on the end-point which is getting people to see your brand as relevant again. Our brand space is largely for women - we love to shop and share information. That’s a powerful audience that you have to share with advertisers." "If you go home and look at yourself in the mirror and you’re not up for it, go get yourself another job." "You have to bring in other people. We worked with a lot of agencies to find the best of that culture and bring it into our business. Your senior management team have to be 100 per cent committed." "Don’t be afraid of intelligent failure, don’t be so demotivated by something that doesn’t work. Nothing changes quickly, everything takes time. In fact proper transformation takes 18-24 months, just have a goal but be able to change it." "When it comes to change, don’t even attempt it without a hell of a lot of chutzpah, bravery and cheek." "We embedded companies inside of our business so we can offer our partners and advertisers the opportunity for content but also quick, innovative digital solutions at the same time." "We did a first-ever transgender cover of Cosmopolitan, our team flew to New York to shoot Laverne Cox, a popular transgender activist. That created a lot of spotlight, a lot of sharing, and a lot of conversations around the brand. It kept us very on-brand and very millennial. "We also partnered with Youtube to look at the top-three influencers in South Africa. If you go to any of the big five platforms who have threatened our existence with a good concept, they will partner with you. By sharing with these influencers and platforms, we were able to amplify our reach."